favorite fall pic, originally uploaded by kindred threads. I thought that I would share with you what has always been one of my favorite pictures. It makes me want to sit by the side of the road and fill a canvas with color. Not that I have painted anything but set scenery for many a year. Our area of southwestern Wisconsin is one hidden valley after another of breathtaking beauty, waiting for my camera or one of the areas many talented painters. Maybe next spring I will take the time to reconnect with my long, latent drawing skills. I saw on someones ?? blog, about a resolution to do some sketching for 10 minutes everyday. I’m thinking that would be a worthy goal, and more likely to be acted on than the soon forgotten, 60 situps, a day resolution. That is a gorgeous picture!! It's especially welcome as I sit in my house in NH, hiding from the chilly, rainy day we're having today. PS: I wish I believed I'd keep a resolution like daily sketching. I'd be more likely to do the situps! 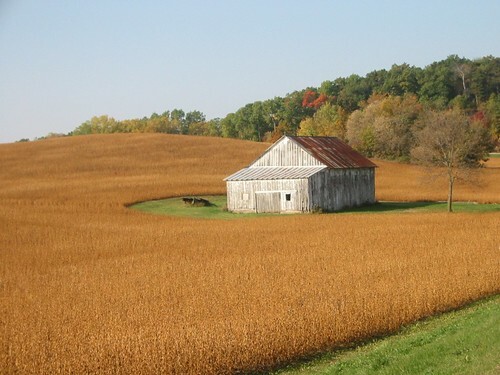 I love rolling hills of grain and barns and everything in this photo. It takes my breath away. I would really like to work on my drawing skills (or lack thereof), too. I got better in my second figure drawing class, but when I was done, I just stopped drawing. It's not really something I needed as a photo major. But, I'm finding that when it comes to textile design, it really helps. Especially with pattern design (one of my classes right now) or silkscreening, or anything of that nature. I've decided though that next summer, after I graduate, I will try to start drawing, and try to get "good" at it. I'll be a little late to the game, but maybe we can encourage each other!